“”It seems to me that the natural world is the greatest source of excitement, the greatest source of visual beauty, the greatest source of intellectual interest. It is the greatest source of so much in life that makes life worth living.”- David Attenborough, English broadcaster and naturalistDo you like to sit back and admire the beauty and wonder of the natural world while the birds happily tweet and sing their songs? You may also like the idea of seeing nature up close and personal without the need to disturb it. 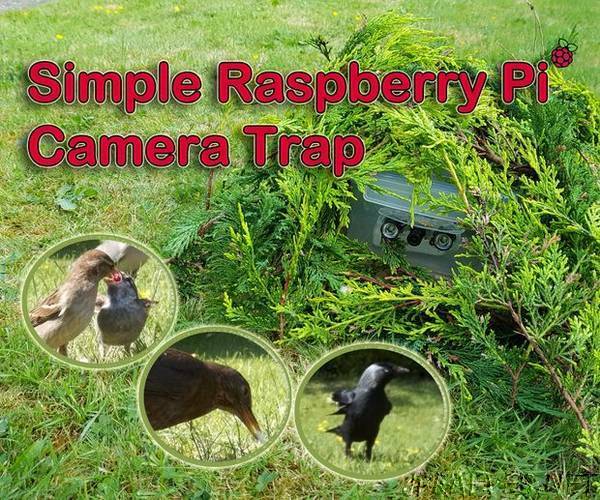 If so, why not consider making yourself a Simple Raspberry Pi Camera Trap! ‘What is a Camera Trap?’ you might ask.. basically it’s a camera with motion sensing capability that triggers the capturing of still or video images whenever something comes into view (such as nature’s wildlife!). Camera traps commonly use a PIR to trigger the taking of a photo or the recording of a video. Unfortunately this can sometimes result in the the best camera shot being missed or the target disappearing altogether before the camera is triggered. With this camera trap we can solve that problem by doing away with the PIR and instead using a detection system that is based on pixel changes in the image. We can also capture the events that take place prior to motion detection (thanks to the capability of the software), which increases the chance of getting that perfect photo or video sequence. With the unusually good weather we’ve been having here in Wales lately there has never been a better time to make it, and fortunately it’s also a bank-holiday weekend so the perfect opportunity to throw one together (mostly from some bits I have lying around the house already). Grab hold of a Raspberry Pi and rummage around the kitchen cupboards for a plastic food container (if you’re married I recommend you check with your partner first, they may not appreciate you raiding the kitchen), and you can throw this thing together in around 30 minutes. Tip: If you use the No-IR Pi Camera Module (without the Infra-red filter) and some IR LED’s, you can make a camera trap with night vision capability.